Hello, dear ones. Have I told you lately how much I appreciate you? I hope your weekends were better than mine. 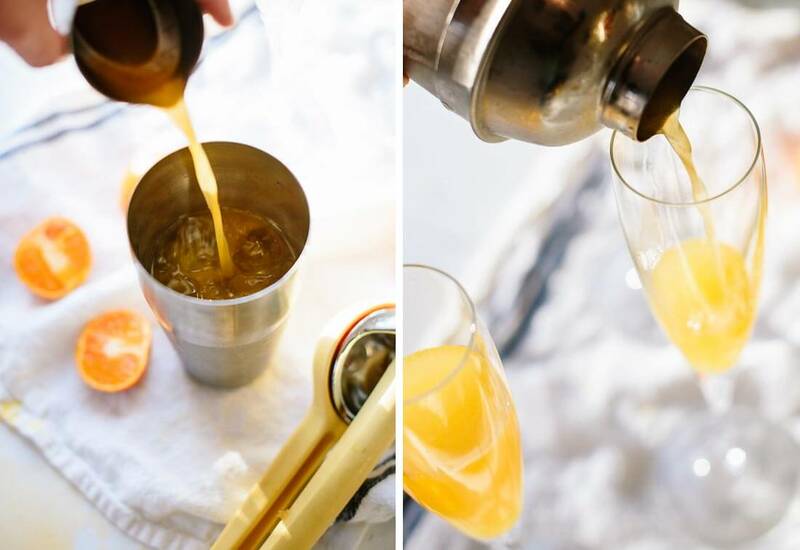 Either way, here’s a cheerful little number that is perfectly suited for brunch, happy hour or a nightcap. 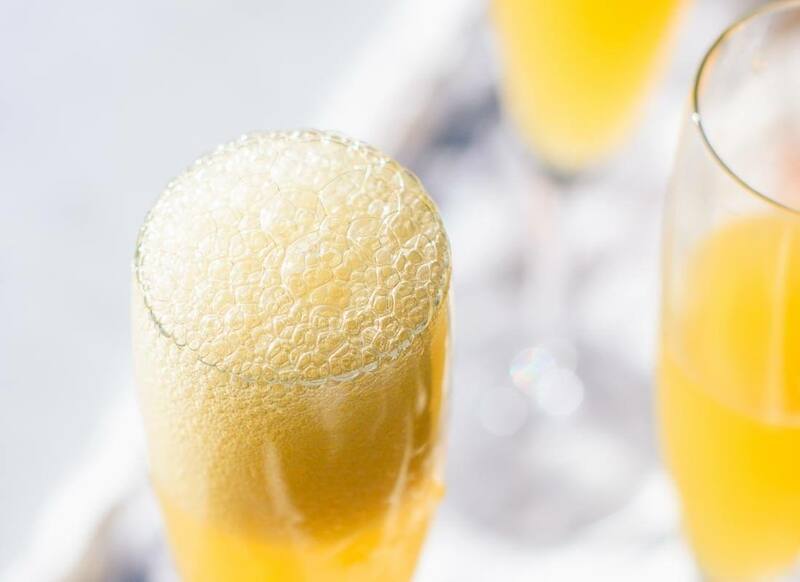 Think of these French 75’s as an extra boozy, extra bright version of traditional orange mimosas. 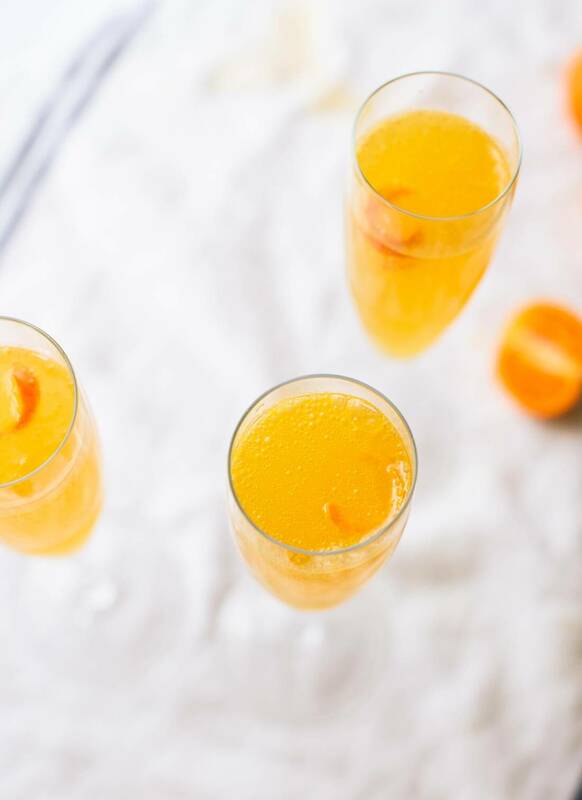 Instead of a traditional French 75 with lemon juice, I thought it would be fun to use clementines, which are in season now. I learned that clementines are really easy to juice with a handheld lemon juicer. 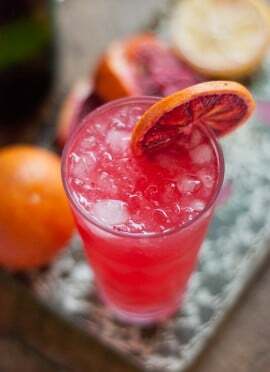 You’ll need a few clementines per drink, so if you’re trying to polish off one of those big bags of them, these cocktails (or this smoothie) will do the trick! 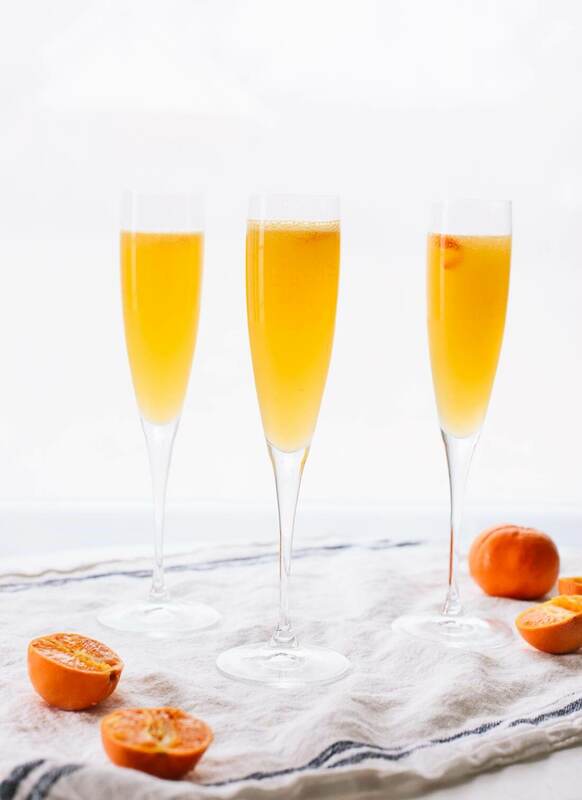 Sunny clementine French 75 cocktails are a perfect brunch or happy hour drink! To make the honey simple syrup: You’ll need to warm the honey so it will mix it into the water. In a tiny saucepan on the stove, combine honey and water. Warm over medium heat, whisking occasionally, just until the honey has melted into the water. Remove from heat. To make a cocktail (you can make multiple drinks at once): Fill a cocktail shaker with ice. Pour in the gin, clementine juice and simple syrup in the proportions listed above. Securely fasten the cap on the shaker and shake until well chilled, about 20 seconds. 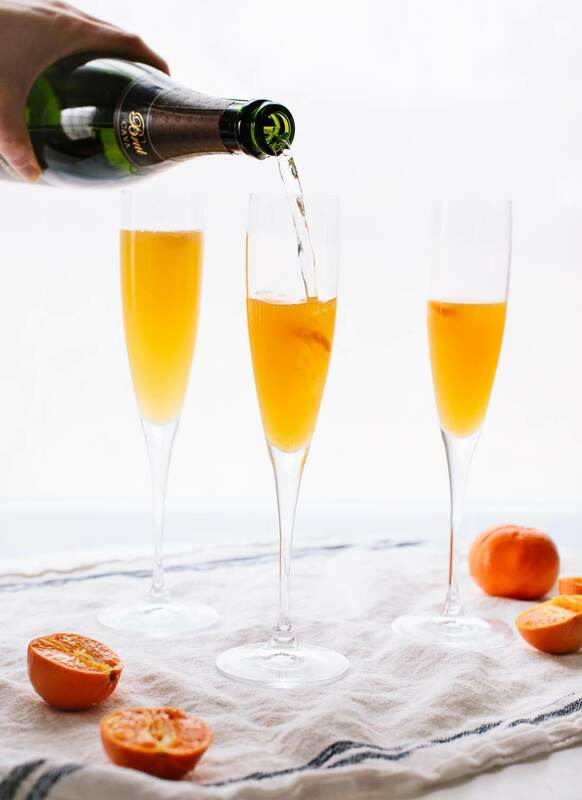 Strain the liquid into Champagne glasses and top with Champagne. Garnish with a twist or wedge of clementine and serve immediately. Recipe adapted from my Earl Grey French 75. *Make it vegan: Either use ¼ ounce agave nectar or substitute regular simple syrup for the honey simple syrup. You can just combine equal parts fine [vegan] sugar and water in a jar and shake it until the sugar disappears into the water. Make it gluten free: I found Hendrick’s on a list of gluten-free gins, but you might double-check to be sure. Change it up: Any fresh citrus juice will work here. If you’re using something really tart, like lemon or lime, scale back to ¾ ounce juice. What a beautiful take on a classic cocktail! Thank you, Ellie! I appreciate it. 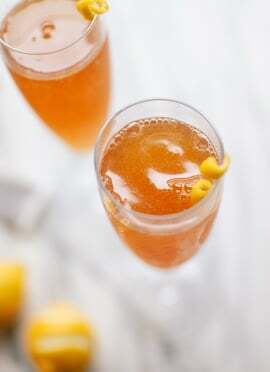 Oh, this reminds me I STILL need to make your Earl Grey French 75! But these look amazing too, and maybe more suited to the early sort of Spring (or less winter-y, actually) we’re having here the past few days. And the upper picture looks stunning. It’s almost like the glasses are floating, with how you can barely see the stem of especially the glass on the left. It’s so nice to see how much progression you’re still making with your pictures. They keep getting more sharp and bold, and these are no exception. Thank you, Evelyn! I don’t want to speak too soon, but it’s sure feeling like spring around here. I couldn’t be happier about it. Thank you for the photo compliment—part of it is that I’m uploading photos in a higher resolution, so you can see them in their full glory now. I hope they’re improving overall, too! This sounds SO good! I love the fresh clementine juice in there! I love the idea of the honey simple syrup instead of sugar. I’ll put this one on my cocktail list. Thanks, Celeste! Honey simple syrup adds a little extra flavor, which is lovely here. Ooh what a grown up looking cocktail! 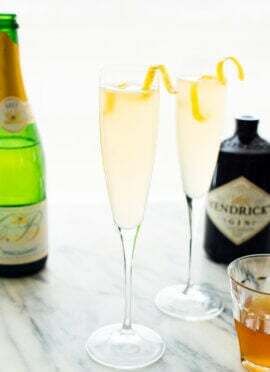 Gin and champagne, it sounds amazing. Hendricks is my favourite gin too! Kate I just want to say how happy I am to have found your blog! My husband and I have been wanting to eat healthier and you have helped a bunch. Now when we buy fresh vegetables we actually eat them before they go bad. :-)And have tried a few we have never eaten before. Hope your week is better than you weekend! I’ve never heard of honey simple syrup before, but now I’m dying to give it a try. What a great idea! Mmmmm….. I love clementines. I wish it were happy hour right now. Yum – It’s Ojai Clementine season & they’re at our farmers market in abundance. That cocktail looks festive & oh so tasty! I bet your extra fresh clementines are extra delicious! Yum!